- After several days of artillery bombardment by both sides, the German XXVII Corps launches an attack at 1030am this morning against the British 28th Division holding the eastern face of the Ypres salient. Though the Germans are able to get into the forward British trench, the attack grinds to a halt. - It is during lunch today that U.S. President Woodrow Wilson is first informed of the sinking of the passenger liner Lusitania yesterday afternoon. By evening the president knows that over a thousand lives have been lost, a number that includes over a hundred American citizens. The attack calls for a response from the American government, a burden that Wilson takes entirely as his own. This evening he slips out of the White House and walks along Pennsylvania Avenue alone in a light rain. For his entire adult life Wilson has been driven by a stern and absolute Presbyterian faith, one that has inspired his life of public service and is the foundation of his political creed. How the sinking of Lusitania fits with his moralistic view of the world is the question the American president now grapples with. Later this evening Wilson returns to the White House and retreats to his study, deep in thought. - In a sharp attack today the German 11th Army seizes the heights between Besko and Frysztak just to the west of the Wislok River in Galicia, while to the north the German Guards Corps secures a bridgehead across the Wislok and to the south X Corps threatens to drive a gap between the Russian XXIV and XXI Corps. The loss of the high ground in particular deprives the Russian 3rd Army of its best defensive positions in the area, prompting General Dimitriev to once again request permission to withdraw his battered army behind the San River. Once again, however, Russian army headquarters refuses, despite the fact that the line they had ordered 3rd Army to hold is now in German hands. Dimitriev thus turns to the planned counterattack of XXI Corps as the only hope to relieve the pressure on his army, though the corps will not be in position to advance until tomorrow evening. - This morning General Hamilton orders yet another attack towards Krithia on Cape Helles. The warships offshore have done their best to destroy the Ottoman defences, but in the roughed terrain it is practically impossible to precisely strike well-concealed positions; in one case, naval fire practically cut off the top of the cliff at Gully Spur, but the machine guns the bombardment was aiming for remained in place. This time it is the New Zealand Brigade that bears the brunt of the fighting, advancing against withering fire and suffering heavily. By early afternoon the attack had collapsed, but another is ordered at 4pm, in which the entire Entente line, spearheaded by 2nd Australian Brigade, was to fix bayonets and charge the enemy line. The attack, like the others before it, is a dismal failure, and by nightfall the survivors are ordered to entrench where they are. 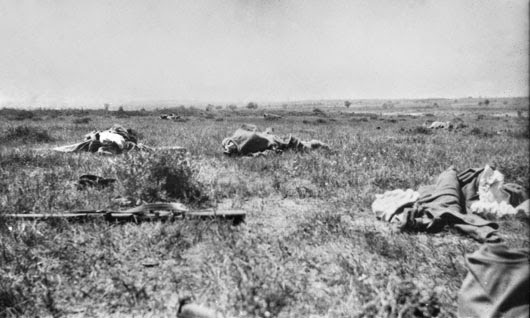 The aftermath of the attack of 2nd Australian Brigade at the 2nd Battle of Krithia, May 8th, 1915. The result of the operation has been failure, as my object remains unachieved. The fortifications and their machine-guns were too scientific and too strongly held to be rushed, although I had every available man today. Our troops have done all that flesh and blood can do against semi-permanent works and they are not able to carry them. More and more munitions will be needed to do so. I fear that this is a very unpalatable conclusion, but I can see no way out of it.